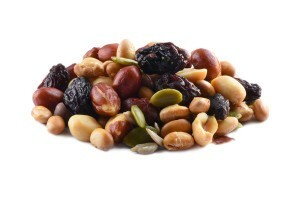 Energy trail mix is a customer favorite. It contains a variety of ingredients that are diverse in texture and flavor. You'll taste a distinct nutty flavor along with a pleasant sweetness as you munch on the mix. Raisins add chewiness to the mixture, while pumpkin seeds provide a subtle crunchiness. This delectable combination is exciting and satisfying. Peanuts (Roasted In Sunflower Oil), Sunflower Meats, Carob Chips (Sugar, Carob, Veg.Oil, Lecithin). Chocolate Covered Peanuts (Sugar, Cocoa Butter, Dry Milk, Chocolate Liquor, Artificial Colors Fd&C # 6, Fd&C #40, Fd&C #1, Corn Oil, Corn Syrup, Carnauba Wax), Soy Beans (Roasted In Soybean Oil) Raisins, Pumkin Seeds. Raisins Product of Chile or Usa, Pumkin Seeds Raisins Product of Chile or Usa, Pumkin Seeds Product of China or Mexico. Our go to snack for sure. Our youngest is rather picky about his school lunch snack and with the chocolate covered peanuts and carob chips this is one he actually likes. Just the right amount of sweets in this mix. Leaves a nice aftertaste. First time getting the Energy Trail Mix. A very nice snack to have around. I’ll get these again. We bought 6 bags. Great lunch snack for the kids and great tasting. This is a delicious mix of nuts for a great price. I will definitely buy again. Very good mix at a very good price. Good balance and taste that is hard to find at a reasonable cost. Very good price for this trail mix and it taste great. our favorite!! the chocolate adds to the taste of everything! Great mix of sweet and salty, I ordered two bags of this and it went quick with the kids as a Treat. Great combo and my family and guests loved it. Loved the trail mix, the raisins were some of the best I have ever had. Fresh and Delicious! I won’t be getting my Hi-energy trail mix from anywhere but NUTSTOP! Great prices, great taste and totally fresh! Sweet and salty snack. Just a perfect treat for company. This is a classic, but I am not a fan of the small sunflower seeds and soybeans. I guess those are the ones that add to the “energy” though! Very tasty combination of mix. Shipping was very fast, had it in a few days. Highly recommended. Repeat customer. Excellent trail mix, great price. Note: ingredients listed above are slightly different than those listed on and included inside the bag. My bags did not contain pumpkin seeds or chocolate covered peanuts. They did contain chocolate gems (m and m type candy) instead. Not a deal breaker by any means. I ordered a 25 pound bag of the energy mix on 12/11/15 and have almost finished it 3 months later. It’s well worth the $50. Lots of chocolates. The only downside is that the sunflower kernels end of falling to the bottom of each batch once you’ve separated some portion sand it tends to look like a trailmix of just sunflower kernels. Overall I recommend it for anyone interested in a typical mountain trail mix. There’s trail mix and then there’s you energy mix. There’s no comparison in my opinion. I love the combination of goodies you put in this stuff. Also, the price can’t be beat. Keep up the great job you do with all you products. At least the ones I’ve tried so far. This will be a great addition to our Superbowl party!! Very nice combination, fresh, good texture and tasty. Juicy raisins and exceptional soy beans. Fantastic price, fast shipping, and most importantly great combination of nuts, seeds and carob/chocolate. 5g of protein/serving! A perfect snack. If you like a true fresh mix of energy snack items in each hand you should try this. They sell very well in my store. Simply a very fresh mix and taste.